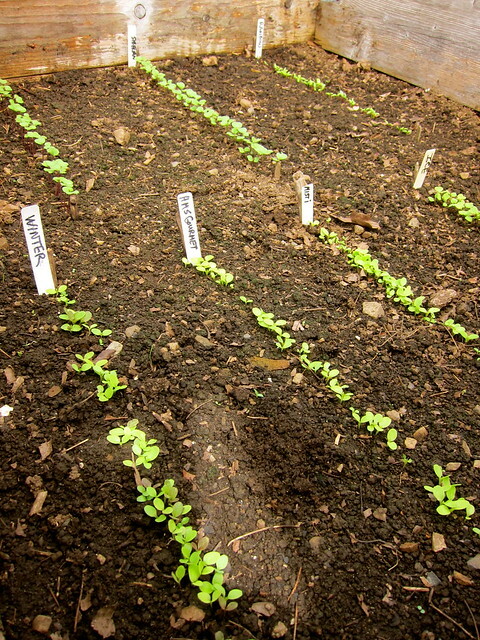 It’ll be June before the peas are ready, but the sight of these tender seedlings excite us all the same. It’s as if by planting a seed and watching it grow, one gets the sense that everything is in their proper order and all is right with the world. There’s not much in the garden yet, mostly alliums. 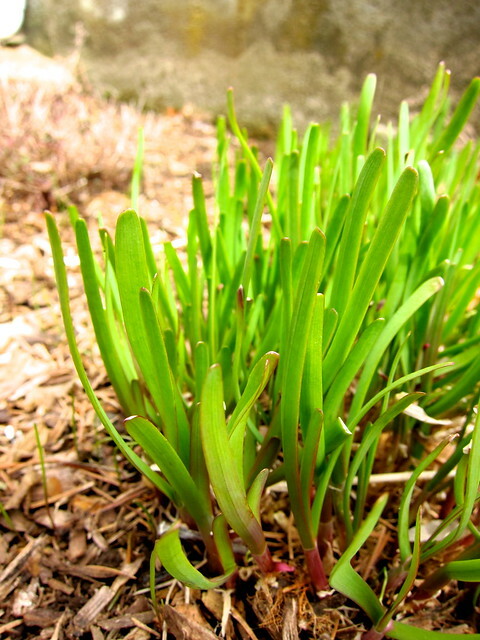 Along with garlic chives (above), we’ve begun foraging chives and green Egyptian onion tops to add to our meals. Overnight temperatures remain in the 40’s, and covering the raised beds warms the soil enough to give the salad greens, chard and kale (above) a boost. Until these are ready to eat, we rely on local farmers’ markets, which begin a new season this week. Cleaning out the herb bed gives us a chance to check on what has made it through the winter. 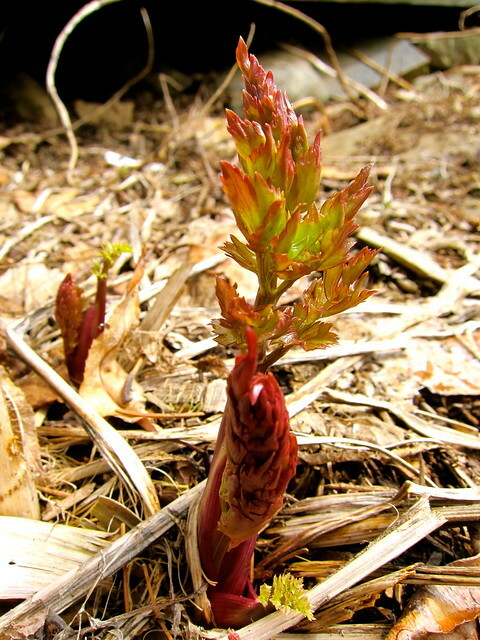 The lovage (above) has pushed it’s way through, like a tiny flame from sleeping embers, and is a welcome sight. 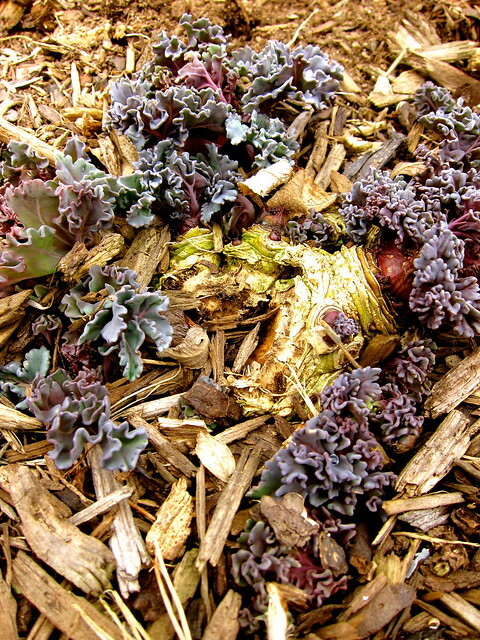 The sea kale is another edible perennial now emerging. We’re keeping a close watch on it this year in hopes of catching this gnarly looking mass at a more palatable stage. This entry was posted in garden and tagged alliums, chard, garlic chives, herbs, kale, lovage, peas, salad greens, sea kale. Bookmark the permalink. Love, love, love the sight of new growth reaching toward the light, a spring promise of summer bounty. Ah, spring. It’s about time!!! I’ve got a few shoots fighting their way toward the sun as well. What a great time of year. Such little lovelies emerging. Do tell us more about the sea kale, I’ve never tried that before. It’s not easy to find sources, ours came from Food Forest Farm. We’re still learning it, now in it’s third year and suitably established. All parts are edible, and we’ll try capering the seed pods based on your experiments! Your garden is coming alive. I too would like to learn more about the sea kale. We’re learning as we go along, hopefully we’ll have seeds to give away seeds the end of the season! Oh I’ve never heard of sea kale either. Just wikipediaed it and I’m excited to see more! Whenever I hear the words ‘perennial vegetable’ I get excited. We discovered it on a permaculture plant list, and are excited to see what uses it can be put to! It has a strong flavor similar to celery, a little goes a long way! 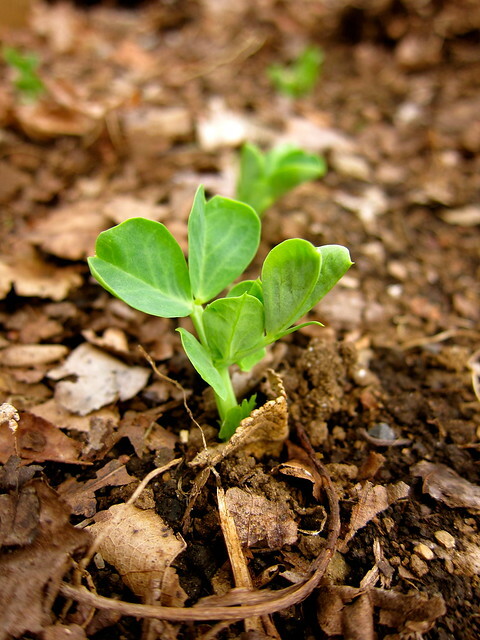 Love the photo of the pea seedling! I have a lovage plant too and it is quite resilient. I must find some sea kale: it looks quite intriguing. It’s a beautiful plant and holds its own as a perennial ornamental!